Kosmea is one of my favourite natural skincare brands as their products are kind to my skin and the beauty of natural skincare products is that they contain ingredients which are good for the skin. I have reviewed and enjoyed using their Daily Facial Exfoliant, you can read my post here. Toners and mists can be used in a number of ways: it can be used to tone and balance the skin, as a hydrating mist to set makeup or even as a pick-me-up spritz to freshen the skin after a long day. 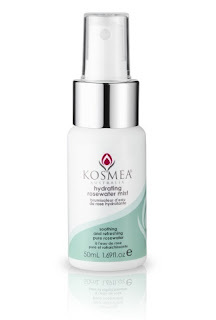 Kosmea Hydrating Rosewater Mist (A$19.95/125 ml) has the core ingredient Pure Rose Flower Water which hydrates and refreshes my skin. It's very gentle to my skin and also soothes my skin at the same time. I've been using this product to set my makeup and as a hydrating mist to freshen up at the end of the day. The roseware scent is very uplifting and divine! I love how it leaves my skin feeling great and 'energized'. The mist is housed in a plastic spray bottle and it's very handy to keep around the bathroom or office drawer. The This mist is a definite must-have for my handbag especially during summer. Hydrating Rosewater Mist is available at David Jones Departments in Australia and online at www.kosmea.com.au. Do you use toner or hydrating mists? Which toners/mists do you use? 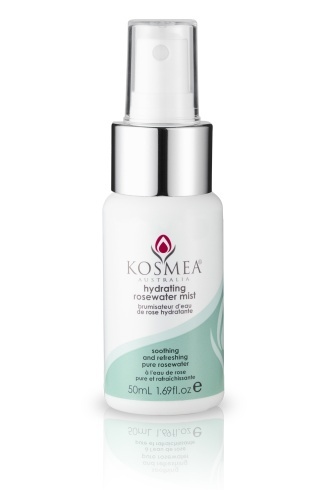 I love this product, I've repurchased a few times now and Kosmea are so generous with sample and gifts with purchase I seem to get so many free ones as well. I also like the ones by Sukin and Echolife. I love Kosmea's skincare miniature packs as they are so convenient for travel! I must have a look at Sukin and Echolife mists when I have the chance!